Last year we saw a company show off how 3D printers have reached the point where people can literally print their own cars. Now this month we’ve begun to see the very real application of that idea as Japan’s oldest car manufacturer, Daihatsu has just announced that they are officially collaborating with local designers and artists to offer customizable 3D printable “Effect Skins” for their new Copen 2-door convertible. 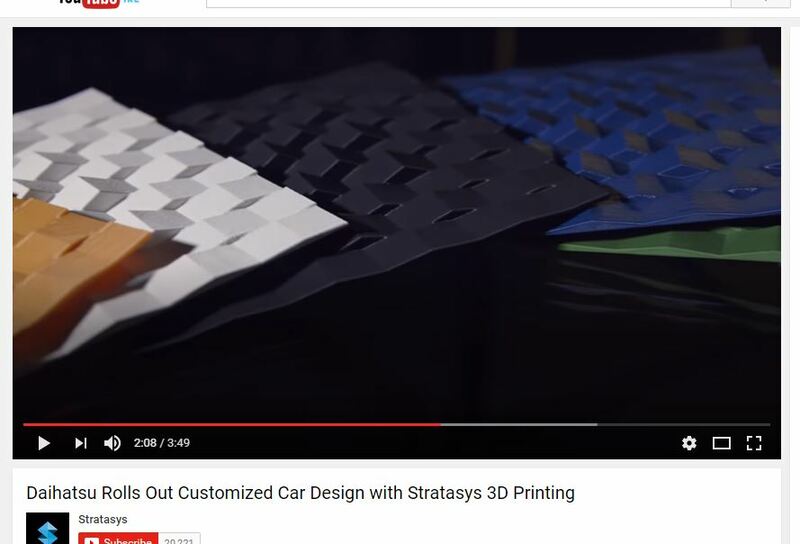 The 3D printers being used are manufactured by 3D printing industry leader Stratasys. And With Daihatsu, they will be used to custom make the several decorative features that can be placed on the cars. Users can literally remake their car as they see fit. 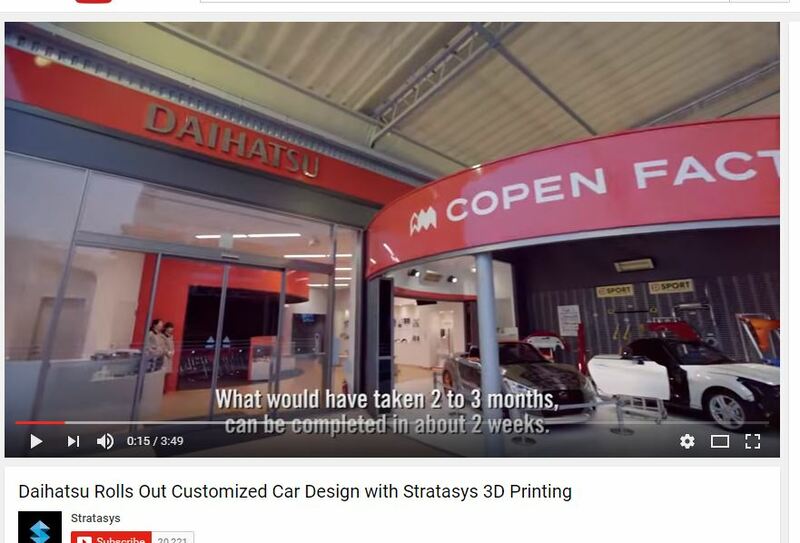 Daihatsu is one of the first major automotive companies to offer fully customizable, 3D printed, end-use parts to vehicle owners as a feature. The way it works is that owners will order their designs and Daihatsu will be able to 3D print and ship the parts within two weeks, a process that Daihatsu said would have traditionally taken more than two months. It has only been a couple of years since 3D printing expanded into the mainstream. It has quickly evolved from a prototyping technology to being used for factory tooling, these days it is being used for end-use products including toys and baking goods. What Daihatsu is doing here is unprecedented by offering their customers a level of customization options unrivaled by any other automaker. Kota Nezu from industrial design company Znug Design, Inc. and 3D creator Sun Junjie are just a few of the big name designers working with the automobile company and they have both created a total of 15 different what is referred to as effect “skin” patterns. What is it you customize? The primary things that drivers are able to customize are the aforementioned skin patterns. What these are entails geometric or an organic patterns, including designs like a basket weave, bubbles and a starburst pattern that make for panels which can be can be affixed to select areas of each car — front and rear bumpers, or the fenders, in any combination. Each of these panels are custom 3D printer for each car. An owner can even further customize the selected pattern by adjusting the parameters of the pattern designs, such as making the pattern larger, smaller or even irregular. At that point nearly every Daihatsu car owner can make their vehicles’ decorative features truly unique and will never face the parts that they want being out of stock or unavailable. The 3D printable skin patterns are currently coming in the ten different color materials (red, orange, yellow, green, dark blue, white, dark gray, light gray, ivory and black)that are currently supported by Stratasys Fortus 3D printers and as such they will be printed using Stratasys’ Fortus Production 3D Printers advanced ASA thermoplastic materials. What is unique about the ASA material is that they are extremely durable and can easily take the stress that the open elements will deliver. The material is even highly UV resistant with colors that won’t fade or warp, and best of all have a smooth and clean surface finish. 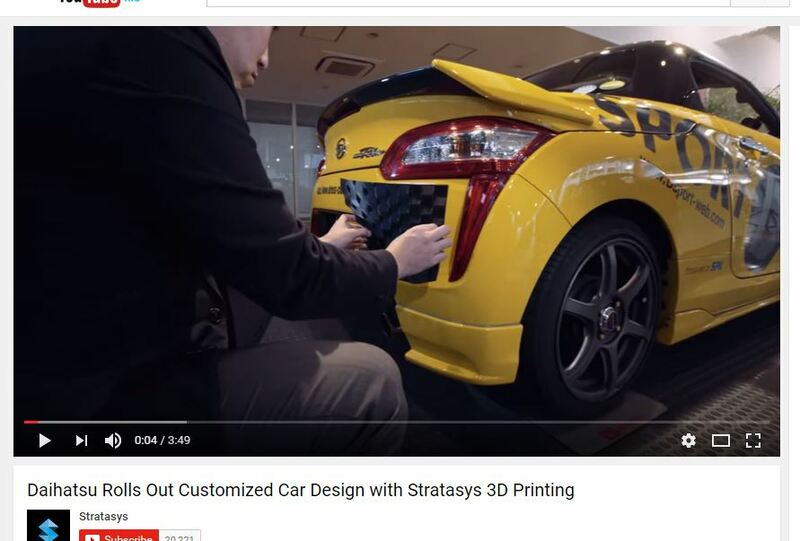 What does this mean for Daihatsu and Stratasys? Daihatsu is one of the world’s largest manufacturers of small and compact automobiles. They have been associated for decades with low-cost and quirky cars that are noted by fans for their unique color options. Their vehicles were sold in the US by Toyota under the Scion marquee until the line went defunct recently. However we can imagine that Scion and their fan base would have enjoyed an expanded range of decorative features and designs for customers to choose from or customize. 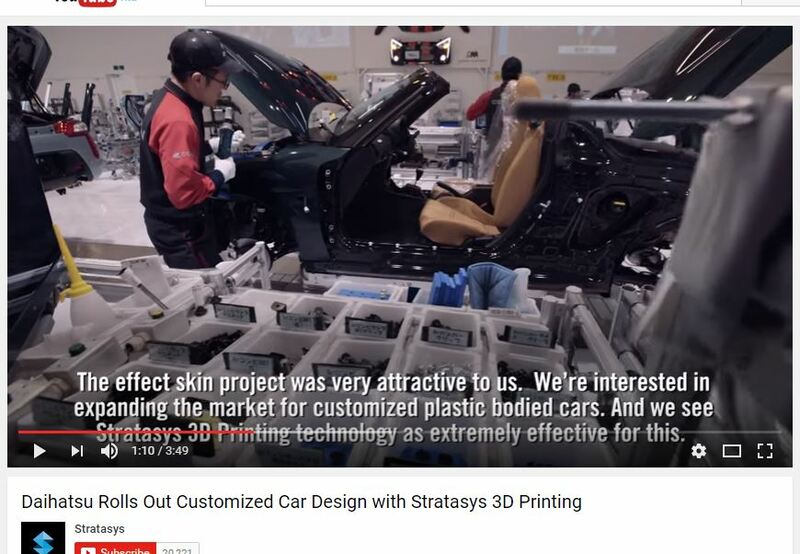 Currently the 3D printed effect skins are only going to be available in Japan, however given Stratasys’ global reach, we could expect to see an expansion of the service. It’s only a matter of time before we can start building the whole car on our printers, after all.